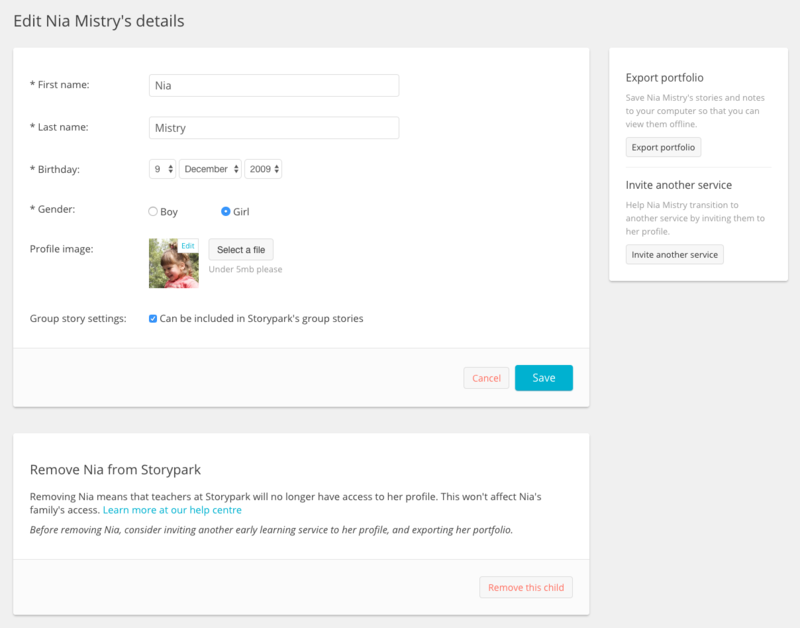 If you are an Admin (this article explains how to make a teacher an Admin), you can edit a child’s details or remove the child from your Storypark community on the child’s profile page. Click on the menu at the top of the page. Click the ‘Children’ link under your early learning service's name. Find the child who you’d like to edit or remove. Click the little arrow on the top right of that child's panel and select 'Edit' from the drop down menu. Edit the child's name, birthday, gender and profile image. Before your children head to another early learning service or to school, you can can invite their future teachers to Storypark so they can share the child’s learning journey. If they accept your invite they’ll have the same access to the child’s profile as your early learning service and be able to contribute to the child’s learning journey within Storypark. To learn how to invite a new early learning service or school please read, ‘Transferring children between early learning services'. Before removing a child, if you have stories written about them, you may want to export their stories using the export options at the bottom of the form to keep them on file. This article explains how. 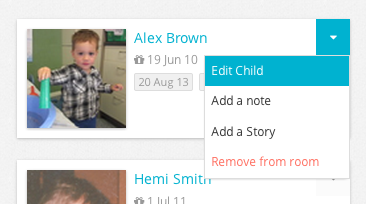 You can remove children from your Storypark account by scrolling to the bottom of the page and clicking 'remove this child’. This doesn’t delete the child and their stories from Storypark, it simply removes them from your early learning service’s account. The child’s family will still have access to the child’s profile and stories. Note: If you remove one child from your account you then have a free space to replace them with another child. At the start of your next billing cycle if you want to change the size of your plan by adding or removing children you can do so.